Leave The A1 at Leeming Bar (JCT51) and take A684 to Leyburn. Turn left at the mini roundabout in Leyburn towards Wensley and Hawes. Turn right in Wensley towards Redmire, Preston and Bolton Castle. Take the first right turn in Redmire signed Reeth. Do not follow the road round to the right but carry on straight across the junctions and down the access only road. 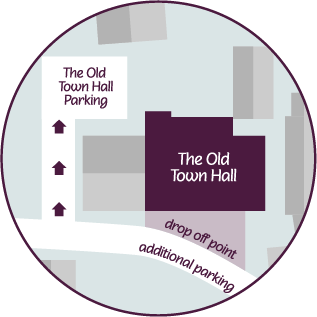 The Old Town Hall is on your left hand side. Leave at Junction 37 & take the A684 to Sedbergh. Stay on A684 to Hawes and towards Leyburn. Turn left at the sign for Aysgarth Falls as you are leaving Aysgarth village. At the T junction turn right towards Carperby and Redmire. Just after the 30MPH sign in Redmire turn left up a narrow lane. The Old Town Hall is just after the bend on the right hand side. Our car park is just behind the building, up the drive by the Town Hall Cottage. Please turn into a drive and at the end of the drive turn to the right and park up against our garden, leaving enough room for two other vehicles. If you have a large amount of luggage it would be advisable to pull up outside the front door to unload. The nearest airport is Durham Tees Valley (Darlington). Other airports within a reasonble distance are Manchester, Leeds/Bradford and Newcastle. Please enquire about your onward journey from these airports.